Several chefs in the grilling extravaganza in our June issue reminded us how crucial it is to cook on a pristine grill: Any soot makes your food taste nasty, and makes it stick too. 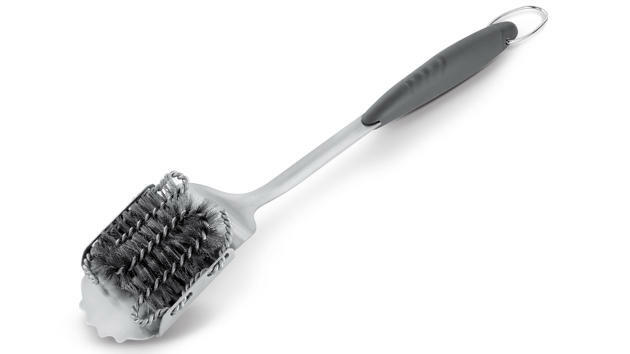 So if you’re looking for a last-minute Father’s Day gift for the dad in your life who loves to grill, consider getting him a great grill brush. For years I got by with an inexpensive grill brush I picked up at a hardware store, but the plastic casing kept melting, and the stubby size made for hot work near the fire. Recently I splurged on a heavy-gauge Weber Style stainless grill brush, and I love it. The longer length means I don’t scorch my arms, the heads have two sides so they last longer, and they’re replaceable. As for technique (maybe you and Dad can work on this together), right before and right after cooking, scrub the hot grill grate with the wire grill brush. Then pour vegetable oil onto a wad of paper towels and oil the hot grate with them, using tongs. Clean!